The work is based on a wonderful conversation I was having with a group of very intelligent women while I was throwing horn shapes on the wheel. I imagined the old myth that wheel thrown clay could record the sounds playing at the time the pots are created. I fired the horns in a way to make them look more archaic and re-created and recorded the conversation. 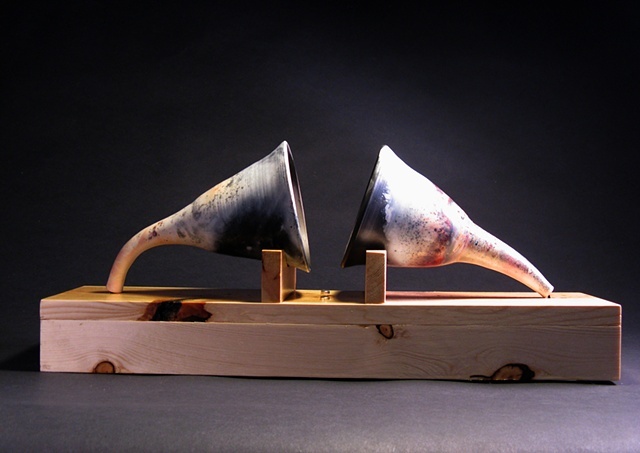 One horn plays a conversation while the second records it. The second horn will then play back what it had just recorded while the first horn records. The horns also pick up any background conversations and add them to the mix. Over time the sound of the conversation degrades and sounds like a soft wind.